At Her Majesty’s pleasure (His Majesty when appropriate, sometimes abbreviated to Queen’s or King’s Pleasure) is a legal term of art derived from the fact that the authority for all governance stems from the Crown. Originating from the United Kingdom, it is now used throughout the Commonwealth realms, though usually in a traditional manner. In realms where the monarch is represented by a viceroy, the phrase may be modified to be at the Governor’s pleasure, since the governor-general, governor, or lieutenant governor is the Queen’s personal agent in the country. In nations under a presidential form of government, the phrase has been adapted to suit the title of the chief executive. The term is also used to describe detainment in prison or a psychiatric hospital for an indefinite length of time; a judge may rule that a person be “detained at Her Majesty’s pleasure” for serious offences or based on a successful insanity defence. This is sometimes used where there is a great risk of re-offending; however, it is most often used for juvenile offenders, usually as a substitute for life sentencing (which would naturally be much longer for younger offenders). In rhetoric, parallelism involves the juxtaposition of two or more identical or equivalent syntactic constructions, especially those expressing the same sentiment with slight modifications, introduced for rhetorical effect. In short, parallelism means giving two or more parts of the sentences a similar form so as to give the whole a definite pattern. Parallelisms of various sorts are the chief rhetorical device of Biblical poetry in Hebrew. In fact, Robert Lowth coined the term parallelismus membrorum (parallelism of members, i.e. poetic lines) in his 1788 book, Lectures on the Sacred Poetry of the Hebrew Nation. In addition, Chinese poetry uses parallelism in its first form. In a parallel couplet not only must the content, the parts of speech, the mythological and historical and geographical allusions, be all separately matched and balanced, but most of the tones must also be paired reciprocally. Even tones are conjoined with inflected ones, and vice versa. ‘In the late 1960s, two elderly American tourists who had been touring Scotland reported that, in their travels, they had come to a Scottish town in which there was a great ruined cathedral. As they stood in the ruins, they saw a small boy and they asked him when the cathedral had been so badly damaged. He replied in the war. Their immediate interpretation, in the late 1960s, was that he must be referring to the Second World War which had ended only twenty years earlier. But then they thought that the ruins looked as if they had been in their dilapidated state for much longer than that, so they eventually discovered, had formally ended in 1745. 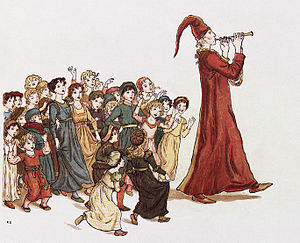 When writing about the seduction of children, the Pied Piper effect is a term used by experts on paedophilia to describe a person’s “unique ability to identify with children”. The term is based on a medieval story about the rat catcher of Hamelin (Hameln), Germany. The earliest references to the infamous Pied Piper probably date back to the 13th century. These stories describe a piper, dressed in multicoloured clothing, leading a group of children away from the town – never to return. In the 16th century the story was expanded into a full narrative, in which the piper is a rat-catcher hired by the town to lure rats away with his magic pipe. When the citizenry refuses to pay for this service, he retaliates by turning his magic on their children, leading them away as he had the rats. This version of the story spread as a fairy tale and has also appeared in the writings of, among others, Johann Wolfgang von Goethe and the Brothers Grimm. Unfortunately, whichever way you look at it, it remains a sad story. However, it is a good reminder of the fact that early European fairy tales had quite harsh plots. According to the German Lueneburg manuscript (c. 1440–50) 130 children were seduced by the piper and lost on 26 June, 1284. Franz Josef Haydn (1732-1809) is often said to be an Austrian composer but, though he was born in Austria, he was in fact 100% German. Haydn was from a poor background: his mother was a cook and his father was a wheelwright. The chemical element germanium was discovered by the German chemist Clemens Winkler (1838-1904) and named after Germania, Latin for Germany. The German poet Christian Morgenstern died of tuberculosis in 1914. He had contracted it from his mother, who had died 33 years earlier. 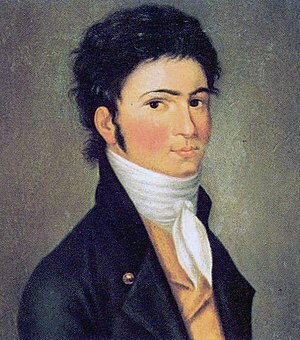 The German composer Beethoven was taught music by the Austrian composers Mozart and Haydn and the Italian composer Salieri. He himself was of Belgian extraction – his grandfather was a Belgian. The Holy Roman Emperor Charles V of Germany (1500-58) was said to have spoken French to men, Italian to women, Spanish to God and German to horses. The pathetic fallacy or anthropomorphic fallacy is the treatment of inanimate objects as if they had human feelings, thought, or sensations. The pathetic fallacy is a special case of the fallacy of reification. The word ‘pathetic’ in this use is related to ‘pathos’ or ’empathy’ (capability of feeling), and is not pejorative. In the discussion of literature, the pathetic fallacy is similar to personification. Personification is direct and explicit in the ascription of life and sentience to the thing in question, whereas the pathetic fallacy is much broader and more allusive. Practical English Usage lists over a hundred common mistakes in the English language. Listed below are a number of mistakes that intermediate students of English often make according to Swan (2005). “I promise I pay you tomorrow.” = I promise I will pay you tomorrow. (217.3) We often use will in promises and threats. Note that the simple present is not possible in these cases. “This is the first time I’m here.” = This is the first time I have been here. (591.1) We use the present perfect in sentences constructed with this/it/that is the first/second/third/only/best/worst etc. “I’ve been here since three days.” = I have been here for three days. (208.1-2) For and since can both be used with a present perfect to talk about duration up to the present. They are not the same. Compare: for + period; since + starting point. We use for for duration – to say how long something lasts. To measure the duration up to the present, we use a perfect tense, not a present tense. “If I’ll have time, I’ll go home.” = If I have time, I’ll go home. (257.2) In an if-clause, we normally use a present tense to talk about the future. This happens after most conjunctions. “If I knew the price, I will tell you.” = If knew the price, I would tell you. (258.2) To talk about unreal or improbable situations now or in the future, we use a past tense in the if-clause (even though the meaning is present or future), and would + infinitive (without to) in the other part of the sentence. “He said me that he was Chinese.” = He told me that he was Chinese. (504.1) Both say and tell are used with direct and indirect speech. (Say is more common than tell with direct speech.) Tell is only used to mean ‘instruct’ or ‘inform’. So we do not use tell with greetings, exclamations or questions, for example. “She told me she has a headache.” = She told me she had a headache. (275.4) After past reporting verbs, we usually change the original tenses even if the things the original speaker said are true. “There’s the man that I work for him.” = There’s the man that I work for. (428.6) We do not use personal pronouns to repeat the meaning of relative pronouns. (494.7) As subjects or objects, who(m), which, and that replace words like she, him or it: one subject or object in a relative clause is enough. “I’ve told you all what I know.” = I’ve told you all (that) I know. (497.2) What is only used to mean ‘the thing(s) which’. It cannot be used as an ordinary relative pronoun after a noun or pronoun. (498.4) Instead, that is often used in identifying relative clauses instead of who/whom/which. That is most common as an object, or as a subject instead of which. (584.1/5) We can usually leave out the relative pronoun that when it is the object in a relative clause. Also, we can often leave out the conjunction that, especially in an informal style.